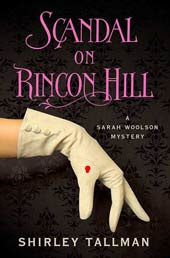 Scandal on Rincon Hill is the fourth Sarah Woolson novel. These books can be read as stand alone novels. I have wanted to check these books out since I first heard about this series but just haven’t gotten around to trying a book out until now. I was expecting a little more of a hook, which didn’t happen for me. It started off good and slowed a bit in the middle and ended alright. Though, I did still like this book. Sarah has guts and usually does things before she fully thinks them though. Somehow things always work out in the end. This book kind of took me back to the Sherlock Holmes vibe with Shirley Tallman’s writing style. Sounds like an intriguing one!